There will be auditions for the CCS National Mock Trial team in the Board room during lunchtime from Mon 3rd -Thurs 6th April 2017. We will select our 19 team members based on attendance and work rate. Bring your lunch with you. The team will depart for Dublin on Fri 7th April and the competition takes place on Sat 8th April in the Criminal Courts of Justice. Please consult the National Mock Trial booklet 2017 at http://www.palddp.ie/ and familiarize yourselves with the two cases. Can you please pass on my thanks to all the students who took part so enthusiastically in the Dublin St Patrick's Parade. We have had lots of positive comments on our section of the parade, including the energetic performance and audience interaction from our performers and i am delighted with how everything went on the day. The participation of the transition year students is a vital part of our performance, finding 60 people willing to dance and drag props of various shapes and sizes round the streets of Dublin is not an easy task and we are very grateful for your participation these last few years. I probably shouldn't single anyone out, but the boys pulling the merman prop probably had the hardest job on the day - largest, heaviest most awkward prop (with a burst tyre to add to the trouble for the last part of the parade) and they didn’t stop working for the whole two + hours of the parade to make sure they never lost touch with the group in front of them. So thanks again to everyone for taking part and I hope they all enjoyed the experience. IMMRAMA - Lismore Festival of Travel Writing - TY Competition! Write an 800 word short story about your favourite air journey and where it took you! Winning stories will be published nationally and in the Aer Lingus in-flight magazine Cara. Prizes - a mini-iPad and Amazon voucher worth Euro 100. Closing Date; May 20th 2017. See www.lismoreimmrama.com/studentcompetition for further details. Free entry to engineering Expo from 10am to 7pm on May the 4th. This may be of interest to TYS thinking of pursuing studies in Engineering. There is NO guarantee that a bus will go from CCS. It may be that pupils would have to make their own way to Sligo IT. Watch this space. Interested pupils must come and give me their name immediately. PAL Workshop (Group 1) 2017 – Mon 27th March- Bring a pen and paper! PAL Workshop (Group 2) 2017 – Tue 28th March- Bring a pen and paper! 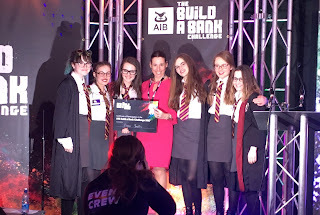 Gringott's Bank Through to the AIB Build a Bank Finals!!!!! 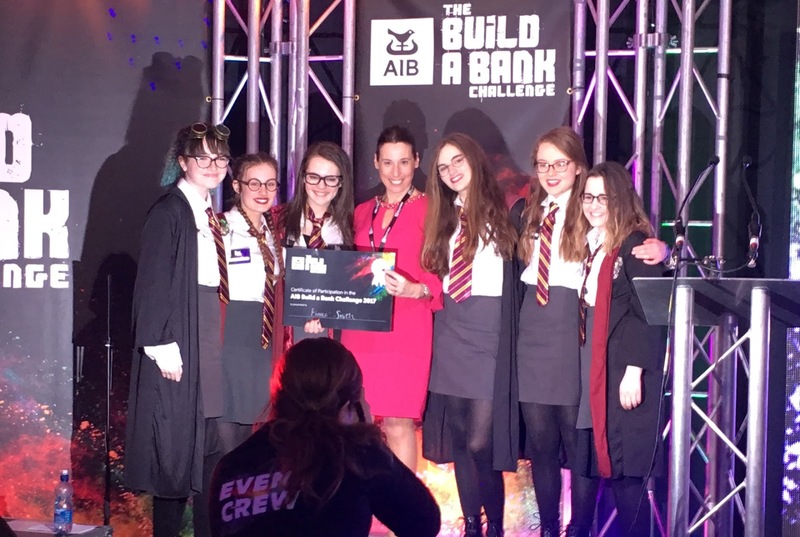 On 16th March, after a quick detour, Gringotts Bank arrived at the Leopardstown Racecourse for the regional finals of AIB's Build a Bank Challenge. After perfecting their display and a grilling from two separate judging panels, the girls' presentation skills shone through and they were selected to attend the National Final in The RDS on the 25th April. Congratulations to Ellen Simmon, Brigid Doherty, Eimear Smith, Aisling McCarron, Rachel Devlin and Katie Durey and not forgetting Mrs Mary Harkin. The pupils won E50 each and E200 for their school. 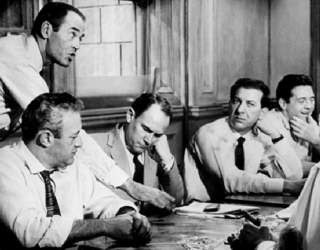 In preparation for the upcoming Public Access to Law workshop, the classic black and white film Twelve Angry Men will be shown to all TYS in the Aras during periods 4-6 on Tue 21st March 2017. Please go to class after the morning break and your teacher will accompany you to the Aras after roll call. This is an EPA competition to get pupils thinking about where their stuff comes from and reflecting on the life cycle of everyday objects. The winning entry wins E500 for themselves and E500 for their school. Unleash your creativity and tell the story of your stuff ...in less than 90 seconds! Pick an object - any object! 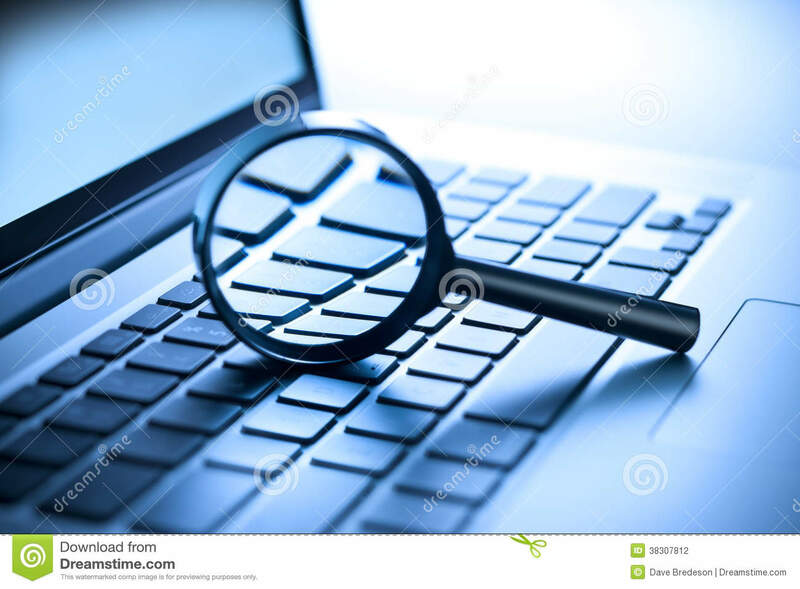 - research its origins and visually tell its story.  How you tell the Story of Your Stuff is up to you - whether it's through a video, a storyboard, a comic book illustration or anything else you can think of!!!! 1, Fill in the form 2. Upload entry 3. Click send! 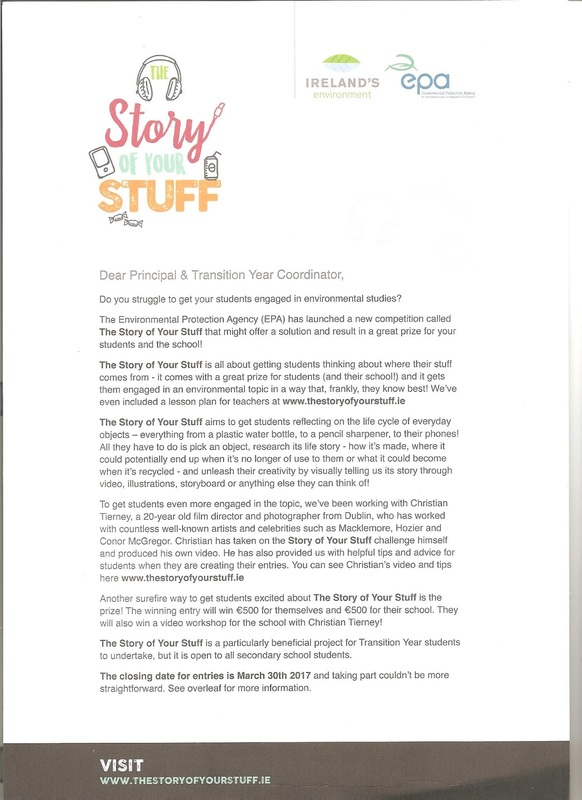 Please see link: http://www.thestoryofyourstuff.ie/ Closing Date is 30th March 2017!!!! See TY notice board for additional information/ideas. Do you have what it takes to support and encourage adult learners of IT during their classes in Carndonagh Library in the month of May? There will be a teacher in charge. 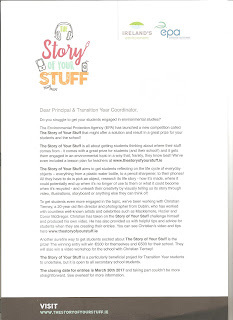 The role of the TYS will be to assist the adult learners as they try things out. These classes are organised every year as part of the Bealtaine Festival. The dates are Friday 5th May, Friday 12th May, Friday 19th May and Friday 26th May from 11 a.m. until between 12.00 and 12.15 p.m. If interested please write your name on the TY notice board on the mall. St.Patrick's Day Preparations Get Underway! There will be a dress rehearsal in the Aras on Fri 3rd March during periods 6 & 7 (1.20 - 2.20 p.m.) for the 57 TYS who have signed up for the Inishowen Carnival Group St. Patrick's Day Parade in Dublin. It won't be long now folks!!! You've heard of speed dating......? Tomorrow, Thurs 2nd March is World Book Day. To celebrate, Ms Crawford has organised a 'Speed Booking' session for the TYS in the Aras during periods 3 and 4! While romance is not the objective of the venture, neither is it precluded!!! !